– how other institutions across the UK are using digital signage to fulfill their particular communication needs and generate revenue. The paper also includes references and links to other educational materials that those interested might want to consult. In simple terms, ”Digital Signage for Education” will give its readers a basic understanding of how the system works, helping them discover potential uses of the system in their particular environment. To download the white paper, click on the image below. This entry was posted in Digital Signage, Whitepapers and tagged digital signage, digital signage for education by Dynamax. Bookmark the permalink. Hi Luisa. Thank you for your enquiry. 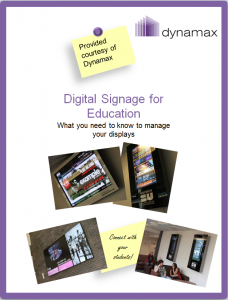 Please email us at info@digitalsignage.net and we’ll send it to you.